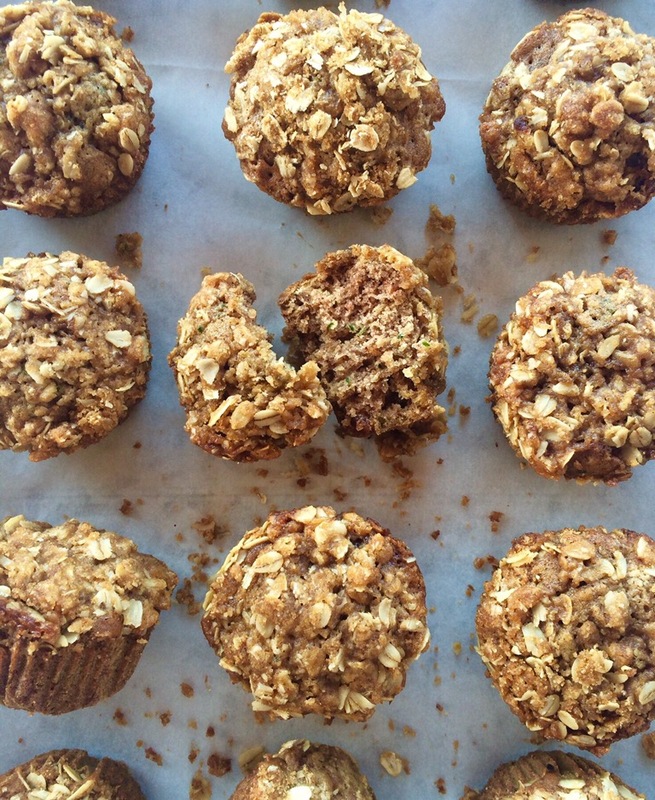 I could not get enough of this zucchini bread, so I decided to make it into muffins and top them off with a streusel topping. These are perfect for a snack or easy breakfast. 1)I used my zucchini bread recipe which makes two loaves of bread. I made one loaf of bread and used the rest of the batter to make the muffins, it made approx. 18 muffins. You could just made a big batch of muffins, which would make approximately 36 muffins. 2)Double streusel topping if making the whole zucchini bread recipe into muffins. Line two muffin tins with cupcake liners. Preheat oven to 425 degrees F.
Divide zucchini bread batter evenly into prepared muffin tins. To make the streusel topping, combine the oats, dark brown sugar, flour, and salt together in a medium mixing bowl. Cut in the cold butter ( I just use a knife to do this). Mix until the streusel resembles coarse crumbs. Sprinkle each muffin generously with prepared streusel topping, lightly pressing the streusel into the tops of each muffin. Bake in preheated oven for 5 minutes and keeping the muffins in the oven, lower the temperature to 350 degrees F. and continue to bake for about 12-13 minutes or until a toothpick inserted in the middle comes out clean. Allow to cool in the muffin tins for about 5 minutes before placing on a cooling wrack to cool.